- Have you ever seen something so rare and unexpected that you were simply bowled over by the sight? Purple roses often evoke such a strong reaction. In the language of flowers, a purple rose means enchantment, irresistible attraction, and love at first sight. The emotion it represents is so overwhelming that nothing more ordinary will do. Its otherworldly beauty is transcendent. Now, imagine having such beauty at your fingertips every day, as you create this lovely image for your own, stitch by stitch. The luscious hues and rich textures make the Dark Rose Cross Stitch Pattern a rewarding project that you will treasure for years to come. Imagine the pride you will feel upon finishing it! The Dark Rose Cross Stitch Pattern is a challenging but achievable project for intermediate stitchers. The design measures 153 by 158 stitches. If you choose to stitch this on 14-count Aida cloth, it will measure approximately 11" by 11 1/2". While the chart was designed for 14-count Aida, you can of course use any even-weave fabric you prefer. The pattern spans multiple pages. Based on the artwork of Emer. No, this is a pattern for counted cross stitch. You will need to provide your own fabric and floss. Can I get this as a digital download? I'm sorry, but we do not offer digital version of cross stitch patterns at this time. Do purple roses really exist? Believe it or not, yes, they do! They are exceedingly rare, but have been created with careful crossbreeding of existing rose varieties. You can also get a "purple rose" by placing a white rose cutting into a vase filled with water and purple food coloring. 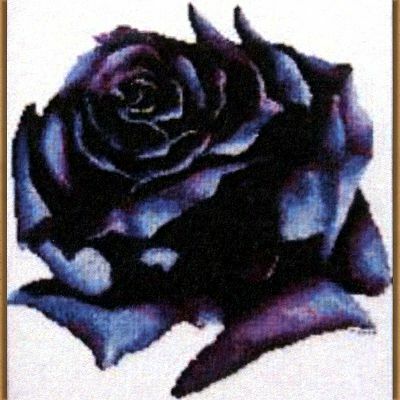 As the water is taken up by the rose, it will turn a purplish shade. 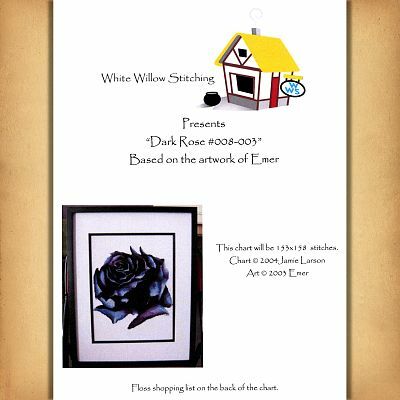 Do you have any other questions about our Dark Rose Cross Stitch Pattern?